In my work with clients, I often talk about limiting beliefs and how our old stories, many of those that stem from deep wounding, can create blocks and difficulties in our lives. While I help my clients explore the root of their limiting beliefs, I also have to be really honest with myself about mine. And sometimes a client’s work shines light on the shadow places within me. Such a powerful experience. Everyone I care about will eventually leave. One of the limiting beliefs that tends to show up for me over and over is the belief that “everyone I care about will eventually leave.” I’ve done much deep work around this belief. I know where it comes from and am even able to witness how life has mirrored this belief back to me time and time again. I can also see how this belief can and has created my reality. This is only half of the story though. As I’ve worked through this belief and as I’ve re-written this story, I’ve also begun to see that simply believing something different won’t necessarily change the fact that some people I care about will leave. If I’m being honest with myself, there are also cases where I will leave the people that I care about too. In fact, there are many cases where I have had to make that choice. Yet, in my mind, the stories still revolved around me being abandoned. Fascinating, isn’t it? This is such a paradox. Even when we realize that our stories are outdated, life continues to present us with experiences that actually corroborate the belief. In order to shift the story and the way life mirrors that story back to us, we have to believe in our authentic truth (instead of the misaligned belief) even before we see it. This is a big leap for many of us, myself included. Though I’ve come a long way in the leaping and trusting category over the past decade. My work isn’t to make these beliefs disappear. Far from it. There are layers and layers of wounding that contribute to this and many other limiting beliefs that I have carried with me. Being aware of these thoughts and feelings is key. And so is catching myself in the moment when I am allowing these thoughts to keep me stuck or block some experience in my life. There is freedom in calling these stories out as false. Even as they are still deeply embedded in our psyche. Once we recognize the false story, we can shift in the moment, re-affirm our truth and take a step forward towards allowing that new truth to be our reality. For me this means that when people I care about choose to leave, it’s not the old victim story of abandonment. Instead, there is a deeper understanding of how as I evolve there will be those who do not choose to evolve with me. And if those people want to leave, I will hold the door open for them. 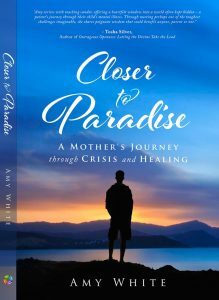 Amy White is an Intuitive Coach, Medium and Energy Healer. She is a truth-teller, transformational teacher and light-shower. 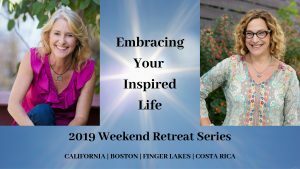 A once self-proclaimed reluctant Intuitive and Medium, Amy now uses these gifts to guide her clients to heal the past, breakthrough challenges, and thrive in their lives.